Are you thinking of surprising someone close to you with a puppy for Christmas? We’ve all seen the videos or TV commercials where someone surprises their kids, wife or boyfriend with a cute little puppy for Christmas or Birthday. It’s adorable; screaming, crying, laughing, all over a 10lb. little ball of fur! How can you pull off such a huge surprise? We promised my daughter a dog of her own for her 10th birthday. Aa a foster dog family, I started keeping an eye out for the right dog for my daughter well before her birthday. It took about 6 months to find our perfect pup. My daughter had so much fun searching and meeting new dogs, and she learned so much about the entire experience. If you are trying to figure out how to surprise your child or someone special with a puppy for Christmas and I’ve got the perfect idea on how to surprise someone with a puppy. But before I reveal my creative ideas, let’s think about why a puppy is the all-time perfect gift. A puppy is cute, cuddly and your special someone has always wanted a puppy! The receiver of this puppy is ready to adopt a puppy, has the time, money and knowledge to raise a puppy. The receiver of this puppy lives in a home that allows dogs and does not ever plan on moving to a home that doesn’t allow dogs. They are ready to make a 15-year commitment to a living, breathing, peeing, pooping, chewing creature! If you answered yes to all four statements above, then let’s move on. Another great resource you should read is our How to Choose and Adopt Your Perfect Dog. How can you adopt a puppy and have it ready on Christmas morning, ready to jump out and surprise your kids, husband or girlfriend. I mean really, it’s not easy to hide a puppy! They bark, yelp, need to eat, pee and poop… how are you going to do all of this and not let the others in your house know? I don’t have the answer to that one, but I do have a better idea. Since the process of adopting a puppy can be just as exciting as receiving a puppy, why not give the gift of the entire experience. The experience of searching for the perfect puppy, adopting the cute puppy, and bringing the puppy home. This is true for adults and kids. So even if you are looking to give your children a puppy for Christmas, the gift of the experience is a much better idea. Your kids will become much more involved in the process, making them more likely to be involved after the new puppy excitement wears off. This was so true for us when we adopted our daughters dog for her birthday present. Some cute ways to give a dog for Christmas is to create a gift box or basket full of puppy items and gift certificates. Include a small stuffed puppy to add to the cuteness and awe of the present. I know it’s not the same as the real thing, but I promise you, this idea will be much more appreciated. Don’t rob your special someone of the experience of adopting a dog. It’s really magical when you get to search and meet the perfect puppy, kind of like love at first sight! Find a really nice basket or gift box and fill it up with all of these puppy products. Place a cute stuffed puppy, like this one, with a note inside and put it under the Christmas tree! Buy one of these Dog Toy Baskets, which can double as the gift basket, then a toy basket after you adopt the puppy! And you can find a ton of puppy toys too. Another great resource is our stocking stuffer gift guide, it has some great ideas for your puppy basket! Because I love you, I wanted to surprise you with the best Christmas gift ever! There is a cute little puppy (or dog) out there waiting for you to find him or her. There are lots of puppies that need a home and I know we can find the perfect one together. My present to you is the entire experience of adopting your own puppy! The perfect time to adopt a new dog is AFTER the holiday hustle and bustle is over, but you can start planning right away. Decide whether you will be adopting from a shelter, rescue, or finding a breeder. Also, consider adopting an older dog, puppies are cute but a ton of work. Senior dogs are a great way to save a dog and ease into dog ownership. Research is going to be key in adoption a new puppy. 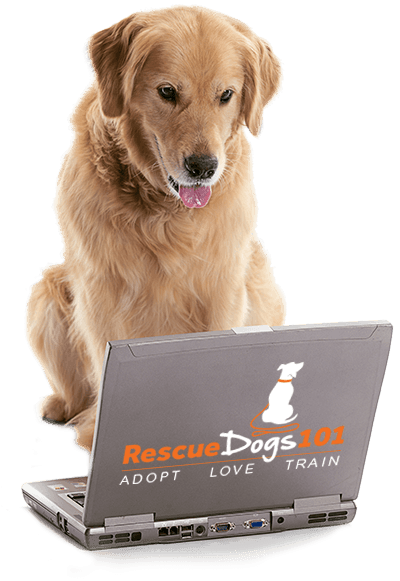 Our dog adoption page has unlimited resources for you when you’re ready to adopt a dog. Taking the right steps in finding your perfect dog will ensure a happy family and happy dog. And there you have it, the perfect way to surprise someone with a puppy for Christmas. I really want to hear your stories after you give the present, so please leave a quick comment below and share your “puppy for Christmas” story! P.S. 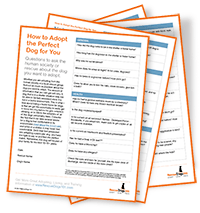 If you haven’t downloaded our FREE Adoption Questionnaire PDF yet do it NOW!